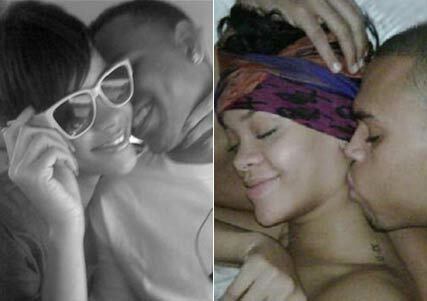 Intimate pictures of Rihanna and Chris Brown kissing and cuddling in bed have surfaced on the internet. Just days after a video of Chris Brown insisting he is ‘not a monster’ hit the internet, personal pics of the couple when they were dating have been leaked on to the web. In one photo, Chris is seen nuzzling into Rihanna‘s neck, while her wide grin indicates she was, at one time, blissfully happy with the R&B star. Brown is facing charges of assault and making criminal threats after the couple’s alleged violent altercation on the night of the Grammys in February. Last week it was also revealed that Rihanna will testify against her former lover in court.